No Bush, No Nukes, No Gitmo… No Gitmo Transfers, No Way! 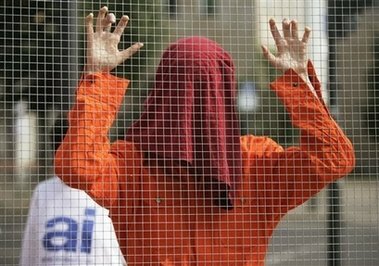 The German government’s position on Guantanamo is crystal-clear: Close Guantanamo! So, Germany – here’s the good news: President Bush offers 4 prisoners to Germany. I mean, that’s great! The undisputed champion of human rights – Germany, of course – could finally show the world how to deal with terrorists in a democratic fashion! Except, these aren’t exactly the type of guys you’d have over for dinner. Therefore, unsurprisingly, Germany is willing to take only two of them, at best. Remember that when you hear all of the Gitmo talk this week while Bush is in Germany. 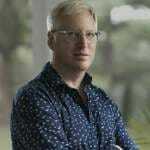 Davids Medienkritik has the full sorry story. Oh, and from these pictures, it looks like the Amnesty International gang, once again, did not have much support from the locals. Though anti-Bush protesters gathered, thousands of police were keeping most far from the areas Bush will tour. 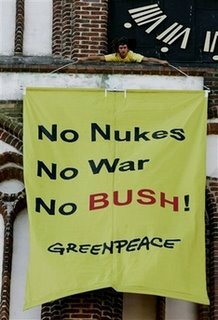 But before the president’s arrival from an overnight in a resort town on the Baltic Sea, a representative from the environmental group Greenpeace struggled to display a yellow “No War, No Nukes, No Bush” banner from the church’s clock tower. After several unsuccessful tries, the protester switched to a smaller version. He then managed to deploy the large banner, but it hung for only a few minutes before appearing to slip and flutter about five stories to the ground. What if You Held a Gitmo Protest & Nobody Came?